Just a 5-minute walk from Ostbahnhof Station, this Courtyard by Marriott is located in Munich’s Haidhausen district. 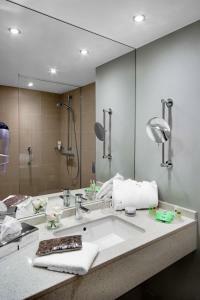 It offers a fitness centre and soundproofed rooms with flat-screen TV. 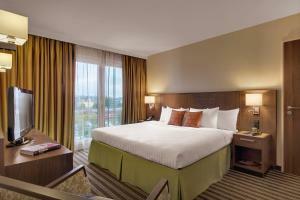 The air-conditioned rooms at the Courtyard by Marriott Munich City East feature stylish furniture and a flat-screen TV. 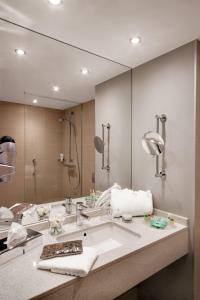 Each is equipped with a kettle and work desk, and the private bathrooms have a hairdryer. There are some climate-friendly rooms, which support a project to reduce the CO2 emissions. German and international cuisine is served in the bright restaurant Bistro-eat.drink.connect, and guests can dine outside on the garden terrace in good weather. The hotel bar offers a wide range of cocktails. Courtyard by Marriott Munich City East is a 10-minute drive from Munich’s Old Town and a 15-minute walk from the Maximilianeum Palace, set in scenic gardens. Trains from Ostbahnhof Station run to all parts of the city.